UK critics finally got their first look at Lee Daniels' all-star epic drama The Butler this week. While it plays out essentially a Civil Rights-themed variation on Forrest Gump, it's actually a true story. And an unusually slushy film for Daniels. 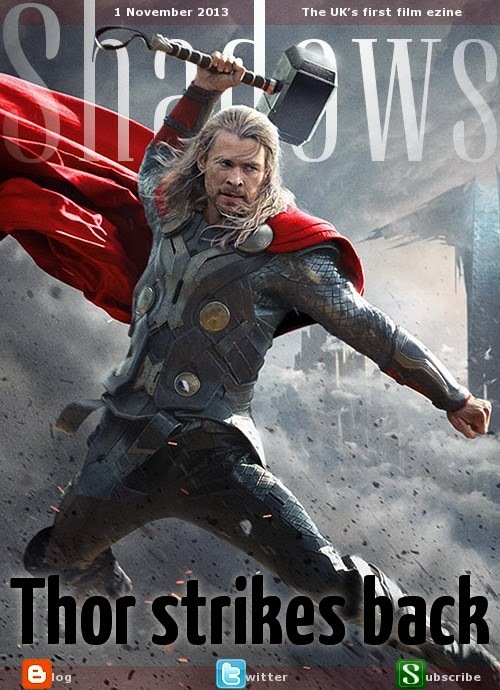 We had a lot more fun watching the sequel Thor: The Dark World, an oversized blockbuster that's so ridiculous that you can't help but smile. But the best movie this past week was Ryan Coogler's Sundance-winning Fruitvale Station, a shocking true drama skilfully filmed without pushing any sort of message other than this kind of thing must never happen again. Off the beaten path, there was the surreal adventure thriller Escape From Tomorrow, a fiendishly clever film shot guerrilla-style at Disney theme parks; the British gypsy drama Traveller, which isn't well enough made to overcome its cliches; and the dark gay thriller Triple Crossed, which makes up for its low budget with a twisty plot and intriguing characters. And we also had three documentaries: the rousing Milius exploring filmmaker John Milius' astounding life and work; the harrowing Pandora's Promise looking into the truth about nuclear power an how it's probably the answer to climate change; and the witty but dry Rough Cut remaking scenes from a fake 1980s slasher horror. This coming week we have Jude Law in Dom Hemingway, the animated adventure Free Birds, the British comedy Breakfast With Jonny Wilkinson, the political thriller Exposed, and the Israeli drama Fill the Void. Post-London Film Festival, UK-based critics are now in catch-up mode with current releases, upcoming films and movies that are vying for our votes in year-end awards. Possibly the most starry movie screened to us this week was Last Vegas, featuring five Oscar winners: Morgan Freeman, Michael Douglas, Robert DeNiro, Kevin Kline (pictured above) and Mary Steenburgen. Comments are embargoed until next week on this one. We also finally got to see Harrison Ford's new movie Ender's Game, which opens this week and is a pretty thrilling ride for 12-year-old boys in the audience. It's very watchable for everyone else too. The rest of the week was pretty eclectic. Idris Elba is impressive in the biopic Mandela: Long Walk to Freedom, which is a little too clearly designed to be the definitive movie about the great man. And his story is genuinely moving. Ralph Fiennes stars in and directs another biopic, The Invisible Woman, about Charles Dickens' secret romance. It's eye-catching but a bit dull and wilfully repressed. Two other films were the polar extreme: the insanely lively and colourful, but unimaginatively titled Cloudy With a Chance of Meatballs 2 is a lot of fun but a bit less satisfying than the first film. And the oddly gentle Jackass Presents: Bad Grandpa is packed with rude humour and raucous pranks, then surprises us with its sentimentality. Requisite Blog Photo: That's bad! 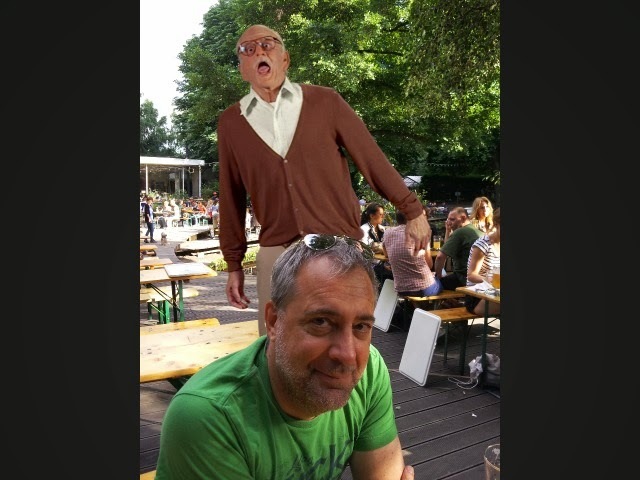 Bad Grandpa photobombed me in Berlin last summer, apparently. And so the 57th London Film Festival comes to a close with the world premiere of Saving Mr Banks, attended by Colin Farrell, Emma Thompson, Tom Hanks and Ruth Wilson - who earlier in the day gave one of the more hilarious press conferences I've attended. The festival was an odd one this year: it's just as un-festive as always, but there was controversy as this year for the first time they charged journalists a whopping £36 for accreditation (especially painful for freelancers, as it comes out of our pay) without giving us anything more. There weren't even goodie bags this year, for the first time in the 18 years I have covered this festival. But then this isn't a proper premiere festival; aside from tonight's closing film, there were no major world premieres. Instead, this is a catch-up event, presenting the best of the past year's festivals, including the winners of Berlin, Cannes, Toronto and Venice. 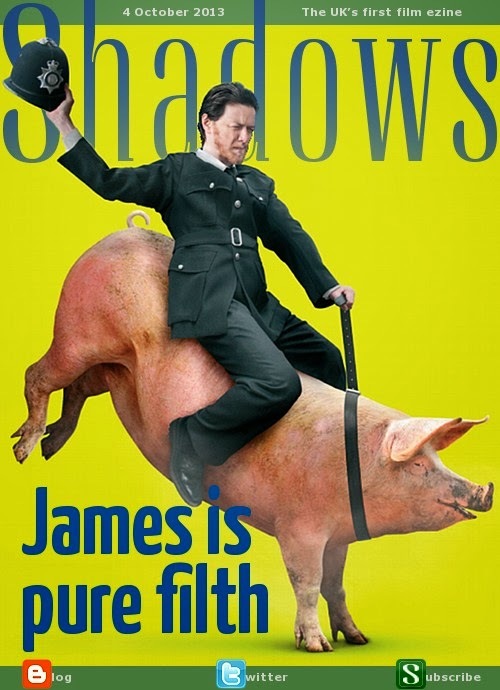 So it's a great programme for film fans who struggle to catch up with these high-profile arthouse titles. It'll certainly always be a highlight of my cinematic year, fee or no fee. dir Michalis Konstantatos; with Nicholas Vlachakis, Eleftheria Komi 13/GR ***. dir Joe Swanberg; with Olivia Wilde, Jake Johnson 13/US ***. dir Adam Wimpenny; with Ed Stoppard, Sophia Myles 13/UK ***. dir Zachary Heinzerling; with Noriko Shinohara, Ushio Shinohara 13/US ***. dir Nanouk Leopold; with Jeroen Willems, Henri Garcin 13/Ned ***. dir Steve McQueen; with Chiwetel Ejiofor, Michael Fassbender 13/US ****. dir Alain Guiraudie; with Pierre Deladonchamps, Christophe Paou 13/Fr ****. dir Fabio Grassadonia, Antonio Piazza; with Saleh Bakri, Sara Serraiocco 13/It ***. dir Destiny Ekaragha; with Malachi Kirby, OC Ukeje 13/UK ***. dir Peter Landesman with Zac Efron, James Badge Dale 13/US **. dir Alex Gibney; with Lance Armstrong, Oprah Winfrey 13/US ***. Exploring a very dark side of Polish society, which echoes in many parts of the world, this drama is compelling and involving. As well as rather overwhelmingly bleak. But it's so beautifully shot and edited, with sharply naturalistic performances, that we can't help but be drawn in. Yes, I also caught some non-LFF movies this past week, including: the Arnie/Sly action thriller Escape Plan, Danny Dyer in the crime drama Vendetta, Sheridan Smith in the girly comedy Powder Room, the British mystery-spoof World of Hurt, and the arty American drama Five Dances. None of them were great (to put it mildly), but they were a nice contrast to the intensity of the festival films. dir Kelly Reichardt; with Jesse Eisenberg, Dakota Fanning 13/US ***. dir Jill Soloway; with Kathryn Hahn, Juno Temple 13/US ***. dir Hirokazu Kore-eda; with Masaharu Fukuyama, Machiko Ono 13/Jpn ****. dir JC Chandor; with Robert Redford 13/US ***. 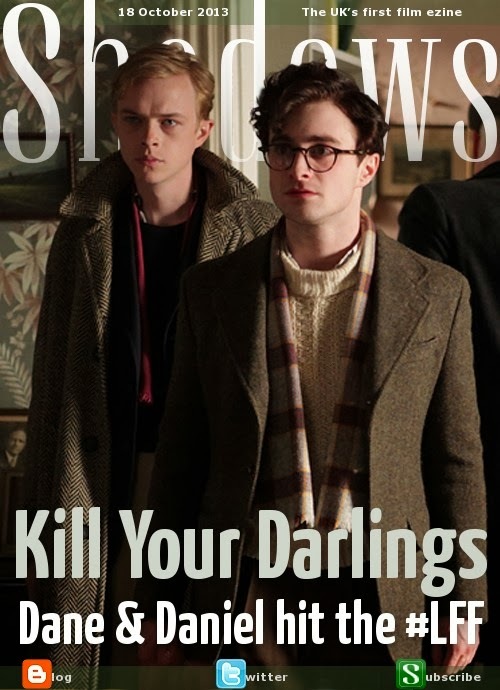 dir Matt Wolf; with Jena Malone, Ben Whishaw 13/US **. dir David Mackenzie; with Jack O'Connell (pictured), Ben Mendelsohn 13/UK ***. dir Joachim Ronning, Espen Sandberg; with Pal Sverre-Hagen, Anders Baasmo Christiansen 12/Nor ***. dir Anne Fontaine; with Naomi Watts, Robin Wright 13/Aus ***. dir Ivan Sen; with Aaron Pedersen, Hugo Weaving 13/Aus ***. dir Calin Peter Netzer with Luminita Gheorghiu, Bogdan Dumitrache 13/Rom ***. dir Wiktor Ericsson; with Joseph Sarno, Peggy Steffans Sarno 13/Swe ***. LFF 1: Aye aye, captain! dir Ari Folman; with Robin Wright, Harvey Keitel 13/Isr ***. I'm not feeling massively human myself after such a busy week. The 21st Raindance Film Festival came to a close Sunday night with the creepy British thriller The Machine (pictured), which also won the top prize for best UK feature. Exploring artificial intelligence with an emotional edge, the film features sharp performances and some genuinely unnerving touches. Also at Raindance, I caught up with the Argentine comedy The Critic, which touched a few nerves in its engaging, cleverly told tale of a film critic's messy life. I saw a couple of independent films outside Raindance: Who Needs Enemies is a low-budget London crime thriller that takes a clever approach to the genre and has a superb cast, but doesn't quite come together. And the comedy-documentary Seduced & Abandoned is a joy for movie fans, as Alec Baldwin and James Toback hit Cannes to sell their Iraq-set remake Last Tango in Tikrit. Pointed and very funny, it's packed with big-name cameos including Bertolucci himself, as well as surprisingly adept raconteur Ryan Gosling. 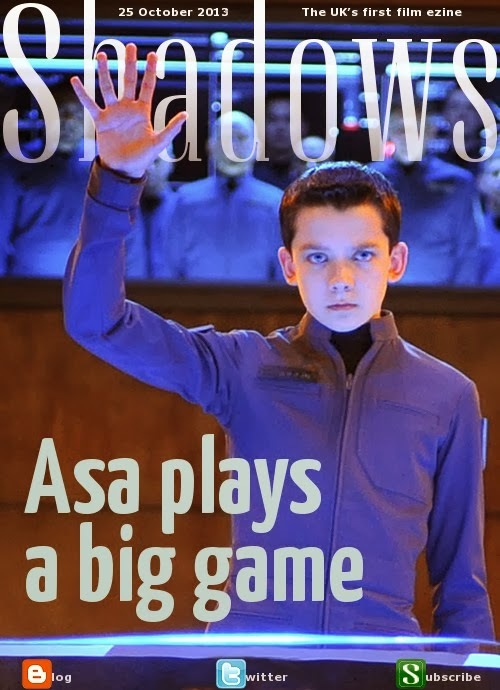 And just last night I attended a massive Ender's Game teaser event with Harrison Ford, Asa Butterfield, Hailee Steinfeld and Ben Kingsley in attendance, but we'll have to wait to actually see the movie. In continuing press screenings for the 57th London Film Festival, which opens Wednesday night, we caught up with Robert Redford's staggeringly well-made but somewhat over-done solo thriller All Is Lost; the amazing Robin Wright as a version of herself in Ari Folman's striking but confusing live-action/animated The Congress; the warm but implausible Brit-com Hello Carter with the likeable Charlie Cox, Christian Cooke and Jodie Whittaker; the provocative French drama Stranger by the Lake, which morphs from a quiet drama into a Hitcockian freakout on a gay-naturist beach; and the documentary Teenage, mixing terrific archive footage along with matching faked scenes that kind of undermine the entire point. This coming week is pretty much devoted to the LFF with screenings of: Alfonso Cuaron's Gravity, Alexander Payne's Nebraska, Jason Reitman's Labor Day, Terry Gilliam's The Zero Theorem, Kelly Reichardt's Night Moves, Xavier Dolan's Tom at the Farm, Bruno Dumont's Camille Claudel 1915, Lukas Moodysson's We Are the Best, David Mackenzie's Starred Up, Hong Sangsoo's Haewon, the Berlinale winner Child's Pose, and the sexploitation doc The Sarnos. There's also a screening of two London movies: the crime thriller Vendetta and the comedy World of Hurt. Whew. At 21st Raindance Film Festival: Outpost 11 (pictured) is a superbly stylised British thriller set in a parallel steampunk Cold War reality. Claustrophobic and unnerving, it's seriously inventive, and deserves a proper release. Jake Squared is a self-indulgent trawl through a filmmaker's own middle-age angst, with a terrific cast including Elias Koteas, Jennifer Jason Leigh, Virginia Madsen and Mike Vogel. But it's far too gimmicky to work. Dirtymoney is a spin on the usual London crime drama, with a much more introspective approach and a strong central performance from Anthony Welsh. And Whoops! is a pitch-black comedy about an accidental serial killer. Strong characters make up for the goofy plot. 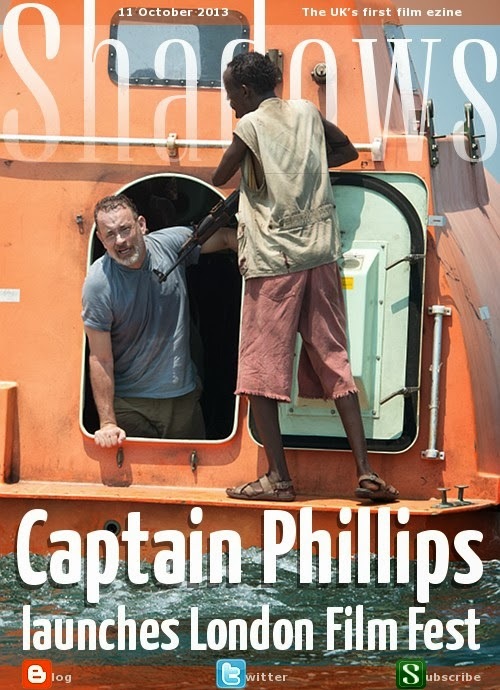 In advance of the 57th London Film Festival (more comments to come): The festival's opening film Captain Phillips is easily one of my best of the year. Joseph Gordon-Levitt's Don Jon is absolutely hilarious. The Spectacular Now is one of the most realistic teen movies we've seen. Afternoon Delight is a sharp comedy that goes to some very bleak places. Francois Ozon's Jeune & Jolie explores the very touchy topic of teen prostitution from an offbeat perspective that forces us to think. Alex Gibney's The Armstrong Lie uses the cyclist's 2009 comeback attempt to frame a detailed story of doping and deception. The British thriller Blackwood adds a clever twist to the ghost horror genre. And the Polish drama Floating Skyscrapers tackles machismo and homophobia from a startling angle. Meanwhile: We had a very late press screening for the disappointing online-casino thriller Runner Runner, starring Justin Timberlake, Ben Affleck and an underused Gemma Arterton. And I also caught up with the schlocker Sharknado before its UK release next week: funniest bad movie ever! This coming week, I have at least two Raindance movies: the Latin drama The Critic and the British comedy Convenience. LFF screenings include Robert Redford in All Is Lost, the comedy Drinking Buddies, the British rom-com Hello Carter, the animated/live-action hybrid The Congress, Bernard Rose's SX_Tape, the French drama Stranger by the Lake and the doc Teenage. And for everyday movies, we have the Stallone-Schwarzenegger thriller Escape Plan, the horror remake We Are What We Are and the Alec Baldwin/James Toback doc Seduced & Abandoned.